My horoscope prediction tells me that my love life is likely to improve from this date! How interesting… for today I am in Canberra chatting to St Mark’s faculty and refining my PhD abstract. Yes, that’s right, I am taking a deep breath and diving into insanity: and what else would a reddresstheology PhD be about other than love?!? Well it might have been about the global turn towards experiential expressions of truth, life and human Being in psychology, religion and culture… but Harvey Cox has already written that book, so now I can move on! The Future of Faith was published by Cox to honour his retirement from the Chair of Divinity at Harvard University. He argues that despite his predictions in the 60s that the world was going secular (The Secular City, 1965) there has in fact been a revival of religion and spirituality across the globe and religion has re-entered the public sphere as a cultural category to be reckoned with. Think: rise of Islam in global geo-politics. Cox thinks this is so much more than a fundamentalist response to a crumbling world – he actually thinks fundamentalism is on its way out. In fact, he thinks that ‘dogma’ and ‘belief’ are on their way out as centralising principles for religion, including Christianity. As a Christian, he sees this as a good thing: a return to the early church where christians were in fellowship with each other by virtue of the spirit and their faith in Jesus. ‘Do you believe in… substitutionary atonement? the infallibility of scripture? the subordination of women? the transfiguration of the bread into the corporal blood of jesus? the supreme authority of the pope? etc. etc. So, even though I don’t have the PhD topic even vaguely under control, I feel that I’m wandering around in this field of questions. What does a theology conceived with/through/in/by Love look like when love is the object not just the subject? What do the 2 commandments (foundational for christian ethics and morality) look like if we switch to a mystical and ‘expansive’ concept of Love rather than a platonic one? If personal experience is the basis of our theology and spirituality, how can we create shared meaning together in church and society? What about the problem of pluralism – we all have different experiences so is a shared meaning system even possible. But most importantly, what a wonderful opportunity to recover the inspired teaching of Jesus who developed a ‘public contextual theology’ and religion based on love not law! All suggestions for PhD title/topic gratefully received! What do you want to read about on reddress for the next 3 years??? 5. 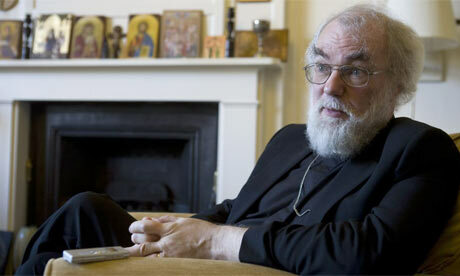 Rowan Williams – in a category all on his own! Three major themes to William’s work – (i) the centrality of the Christian community, with a particular interest in the way language functions in the discourse of faith; (ii) the importance of the doctrine of the Trinity; (iii) the centrality of Scripture, in which he encourages a ‘literal’ reading of scripture which draws us into a conversation – with God, ourselves, and our critical faculties. Embracing Grace is an obtuse collection of essays, which I suspect will make more sense to those familiar with Graeme Garratt’s work, than those who are not. The thematic link which holds the collection together is the authors’ shared admiration of their mentor, whose retirement from the Director of St. Mark’s National Theological Centre at Charles Sturt University this book celebrates. However, the supposed theological link of ‘Grace’ is less easy to track through the writings of the varied authors. “The title of the book was inspired by the centrality of ‘grace’ for Christian theology, both in understanding the grace of God towards us and the acceptance of that grace for living the Christian life in freedom, compassion and joy. Graeme, for us, embodies such a life” (page 2). Because of this failure of the linking theme, some essays seemed to be much more erudite than others, depending on my own capacity to relate to their subject matter. The strength of the book is in the man to whom it is devoted. Garrett himself provides the best way into the collection of essays through his response at the end of the book. “God gives Godself to be known, or knowledge of God does not take place at all. Theology presupposes the embracing grace of God” (page 200). If the task of theology is to extend and apply and facilitate the embrace of god to others, what then is the nature of the many and varied ministries of the Church which in essence are it’s theological tasks? The chapters written by non-professional theologians on The Theologian as Citizen, Conversationalist and Poet (John Langmore, Geoffrey Brennan, Terry Falla respectively) seemed more adept at emulating Graeme Garrett’s personal capacity to extend the theological power of Grace into all areas of life and study. For example, Langmore’s chapter entitled ‘Prophetic Grief and Hope,’ elucidates and gives contemporary examples from Australian public policy, Global Development and Nuclear disarmament, for the long standing Christian tradition in which Garrett stands of believing “not only that human life is sacred but that God seeks for all to live wholly fulfilled lives” (page 90). Such practicality finally gave me a way into the rest of the essays which explored Theologian as Priest, Preacher, Spiritual Director, Biblical Interpreter, Prophet, Ethicist, Peacemaker, Teacher and Writer (Stephen Pickard, Jane Foulcher, Kerrie Hide, John Painter, Thorwald Lorenzen, Sarah Bachelard, David Neville, Heather Thompson and Tom Frame). Of these, Bachelard’s chapter entitled ‘Beyond ‘thou shalt’ lies a deeper word’, stands out with her concise remark: “grace creates the possibility of radical fellowship.” What is clear from these thinkers is that grace has created the possibility of radical discipleship, radical being and believing, radical theology. Radical, in the sense that it has the power to transform the world. I LOVE this book! Ian Mobsby writes more of my own thoughts than anyone else I have ever read. It is so exciting to know someone whose been travelling the same road totally separately and discovering very similar things along the way. Indeed, this is not just a phenomena specific to me, but something Ian writes is happening all over the world in emerging church communities – a rediscovery of the God who is Trinity to lead us into renewed ways of being church, doing theology, living a response to the bible, prayer, mission and so on! God who is Trinity draws us into knowing God through our lived experience rather than a set of objectified facts. God fills our imagination with the possibilities for wholeness in the world, as God fills our hearts with Love and redeems our minds by Grace. This is theology that I can get excited about! In outlining his own vision of the Trinity draws on an incredibly diverse range of theological thinkers: Walter Bruggemann, Pete Rollins, Karl Barth, Brian Edgar, The Cappadocian Fathers and Mothers, Kester Brewin, Paul Tillich and Stuart Murray. Ian’s main concern however, is to connect our transformational experiences of God to a transformational life. “The decline experienced by the Western Church through-out the period of modernity and now in post-modernity, is due in the main to an inedequate theism. Conceptions of God as one’s best friend, or as excessively immanent or transcendent, are the result of a faiture to accept the validity of, and move beyond, the critique of the enlightenment emancipators.” (p.35) The book reviews models of church; challenges of mission in post-modernity; contextual theology; and the challenge of living communally, in light of a replenished encounter with God. 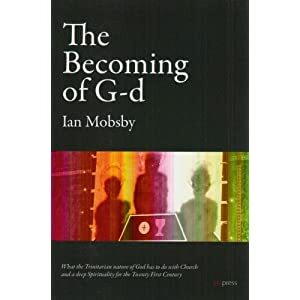 In summing up, Ian Mobsby’s words sum up the reason why I am setting aside 2011 to study: “Theology is the place where God speaks into human discourse, and that as we do mission, it point people to the divine. Religious truth is that which transforms reality rather than that which describes it. In worship and mission we seek to contemplate God, who in turn touches and communicates with humanity. If Church is truly modeled on this approach, it will meet deeply with contemporary culture” (p. 143). Amen!